Home study electronic kits, at pocket money prices, to help people studying for GCSE Electronics, Technology or Physics exams, and beginners to the hobby of electronics. Welcome to the home page of Sir-kit Electronics. E-mail your comments; we love to hear from our visitors. Welcome to all our visitors. We have lots of useful items for students and people who want to teach themselves basic electronics using our simple electronic kits. You'll find everything you need to help study basic electronics whether for an exam or as a fun new hobby or often for an existing project. Our electronic kits are fun to make and fun to use. They also support the practical skills and theoretical knowledge required by major G.C.S.E. exam boards. I have ceased trading as Sir-kit Electronics, but still have stock which I am selling at cost price. You will need to e-mail me if you would like to buy anything shown on this site to find out the availability, cost and how to order and make payment. So I have made all series 1 and series 2 kit instruction sheets available for you to view or download here SERIES 1 KITS and SERIES 2 KITS . Now you can order any parts you don’t already have from me. However I will no longer supply complete kits. . I have posted a mains to 110 VOLT TRANSFORMER on my COMPONENTS PAGE which might be of interest to some people. I have added a blacklight (ultra violet) fluorescent tube to the surplus components list on that page. Also a new goody bag of REED RELAYS (new and unused surplus stock). These are made by a well known manufacturer and specs are easily found on the internet . ONLY £1 for 4 RELAYS. Normally cost more than £2 each! We have a variety of torch bulbs which are useful for all kinds of low voltage lighting projects. Our bargain EXPERIMENTERS GOODY BAGS which contain loads of components useful for circuit development are proving very popular. Check our radio page for some interesting radio projects. We look forward to your e-mails (we enjoy trying to help people with electronics related problems). Recently we helped solve problems for people trying to develop circuits for specific purposes. 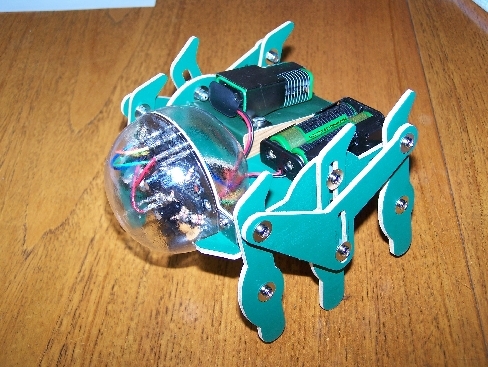 I spent about 20 hours building a robot kit for my grandson a few years ago. It has shown me just how poorly thought out some of these imported kits can be. There were serious errors in the instructions and many of the screws could not be placed where they were meant to be due to severely restricted space. However I'm not easily defeated and with a few modifications and a lot of patience I completed it. It said "suitable for 14+" but I found it difficult with 58 years of experience! No such problems with my Series one and Series two kits which I designed myself and tested with teenagers. joined using short croc clip leads. All the best from Sir and his team. This Mail Order business was started in 1988 to provide a simple, inexpensive and practical system for learning basic electronics, for students studying for GCSE exams. It also proved to be very popular with people who wanted to start electronics as a new hobby. Since starting this web site, over 18 years ago, we have begun adding information pages which we hope will grow into a useful resource for people who are relatively new to the hobby and for those involved in electronics education. The following is a brief description of what you can find on each of the pages on this site. This page describes the system (INPUT, PROCESS [or Control] and OUTPUT) and has a simple system diagram and photos of some built up kits. This page has lots of links to sites that I have found useful and informative. Most are electronics sites but some are for web site building and others are of general interest. SERIES ONE KITS basic electronic kits. 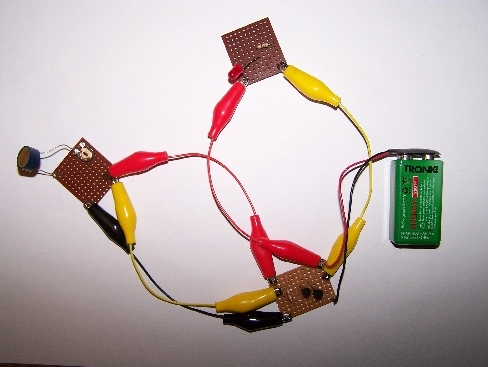 This page shows our analogue circuit educational kits. Including sensor circuits (temperature, light and moisture), transistor switch, darlington, schmitt, 741 op amp (operational amplifier), dc amplifier, time delay, thyristor latch and output circuits including relay (and relay latch), motor, lamp and LED. SERIES TWO KITS simple electronic kits. This page shows our flip-flops (bistable, monostable and astable kits) using both the 555 integrated circuit and the transistor. This page has a range of electronic components for sale including:- wire, solder, switches, resistors, capacitors, diodes, transistors, integrated circuits, light emitting diodes (leds), bulbs, relays, motors, thermistors, light dependant resistors (LDR), battery holders, battery clips, crocodile clips, stripboard, breadboard, project boxes, transformers and potentiometers. This page carries special offers from time to time (when available), and our new goody bags. This page contains a range of value for money electronics hand tools including pliers, screwdrivers, wire cutters, wire strippers, soldering iron, tool sets and special offers (when available). This page shows an led torch. This page shows an led night light & torch economy conversion kit. This page shows our simple, 'build your own' radio kit and a small amplifier kit which can be used with it, or to amplify other sources. This page has ordering details. This page contains advice on building our electronic kits (which may be useful to anyone new to the hobby of electronics). The resistor colour code is shown here. We have included a guide to good soldering practice (HOW TO SOLDER). This page also has a Stripboard Planner, which is a diagram you can select and print so you can plan layouts of your own circuits on stripboard. This page shows an example of how to set out the development of your electronic circuits for your GCSE project and how to prototype with our kits. This page contains 2 worksheets and printed circuit masters (for a plant moisture sensor and a thyristor latching circuit) for use with Key Stage 3 (or possibly KS4) Technology classes. Others may be added at a later date if I get good feedback from people who use this page.